The basics: a stroller and a car seat are items you know you'll need. Our initial purchase was a travel system, the Quattro Tour LATCH Travel System. It is a three-piece travel system for infants through toddlers. Although the stroller moves easily and has a large space for storage underneath the seat, the stroller is too bulky for small cars. It would not fit in the trunk of my car. The MetroLite Travel System would have probably been a better choice. But as a temporary solution, I got this universal stroller, the Snap 'N Go, which is light and compact. Mireya outgrew the height restriction on her infant seat, and again, I was looking for a light and compact stroller that would fit in my car. We found the Savvy Soho Stroller, a very light umbrella style stroller. But quickly we found out that the stroller was not sturdy enough. This stroller does not maneuver well without the use of both hands or one hand placed right in the middle of the handle bar. We had settled with these two strollers or so we thought. One day while browsing for a car seat we discovered and fell in love with the Inglesina Zippy stroller ($239.99). Even Mireya liked this one so much she did not want to get out of it at the store. We found it online at a much better price. Although the basket underneath is small and hard to get to, the light weight, handling and size had me on "hello!" It is by far the best. Don't forget the legendary one-hand fold stroller feature, illustrated on the image on the right. To add yet another purchase to the growing gear collection, we started looking for a convertible car seat, to avoid having to buy car seats for different stages. I spent some time researching and reading many reviews about car seats. Consumer Reports rated about 25 car seats, evaluating their crash protection, ease of use, and fit to vehicle. The ratings and full report can be accessed free online at www.ConsumerReports.org. Now with my finalist in hand, I decided to inspect them closely and in person. I wanted to compare the top-rated contenders; the Titan Deluxe Convertible the Britax Roundabout, and the Eddie Bauer 3-In-1. We decided on the Eddie Bauer 3-In-1 and have no complains. It was recommended as the best for the price by friends and Babies"R"us personnel. But because we needed the convenience of two car seats for our two cars, few months later we started searching for another one. 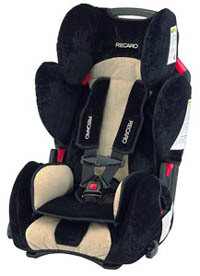 We found the Recaro Young Sport made by the people who manufacture car seats for sports cars. The infant seat is comfortable and secure, it looks and feels luxurious. I love it! Don't forget to protect your car's upholstery and avoid car seats marks or impressions with the Prince Lionheart's Two-Stage Seatsaver. Of course, we had to try a bouncer, everybody was raving about it. We got the Aquarium Take Along Swing, but also considered the Baby Papasan. We later came back and got the Papasan as well. Mireya outgrew the swing quickly but she did enjoy the sound and lights it provided. Both products are great, but if I have to choose one, it will be the Papasan. The Papasan is so cozy and soft, the vibrating function was my favorite. If you are looking for nursery decorating ideas and baby furniture, I highly recommend (for those who live in the Atlanta, Georgia area) the Georgia Baby And Kids (Tel. 770-448-2455), the Baby's Room/Child's Space (Tel. 678-646-0640) and Pottery Barn Kids (Tel. 678-624-0149). The Georgia Baby And Kids carries a large selection of baby and kids furniture and bedding. Look out for special offers and sales that run on a regular basis and save as much as 50%. Also, consider looking for furniture early, some custom items may require additional time on production and delivery. Turnaround time can take up to 3 months, so order in advance. We decided to spend a little more and invest on furniture that will grow with my baby. I wanted a convertible crib, the crib converts into a toddler bed and then into a full-size adult bed. With that in mind, we got a set from the manufacturer Baby's Dream Furniture, Inc. The set included a convertible bed, a 3-drawer chest/changer and a 4-drawer chest. Now we do not have to worry about furniture for a long while. 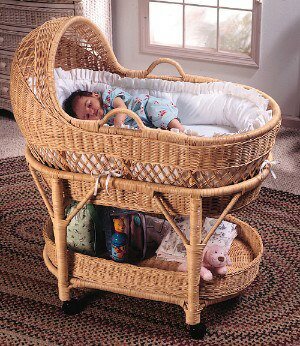 We used to keep Mireya in our room in a beautiful bassinet. But why didn't I think about the Pack 'n Play before? This piece of furniture includes a playard, bassinet, and changing table. I wasted money on a bassinet that was only good for a few months. Other good buys: BabyBjorn Original Carrier, Contoured Changing Pad and Clean Shopper Cover.